Boasting a central location in the lively Sachsenhausen district of Frankfurt, this striking 4-star skyscraper hotel offers a high level of comfort together with magnificent views of the city’s skyline. Recently renovated in 2016, the Leonardo Royal Hotel Frankfurt provides ideal accommodation for guests visiting Frankfurt on a city break, business trip or trade exhibition. There are 480 indoor parking spaces, available for a fee. 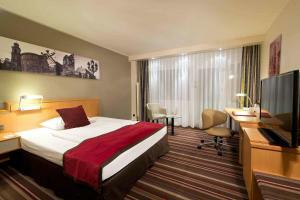 The hotel lies just a 20-minute journey from Frankfurt’s international airport. The main shopping areas and cultural attractions are easy to reach by car or public transport from here, as is the Frankfurt Messe (trade fair centre). Guests are invited to enjoy a hearty breakfast in the Vitruv restauarant, where tables can also be booked for lunch and evening meals. The bistro Leo Lounge offers snacks, desserts and cocktails, while the Leo Sportsbar serves seasonal, rustic dishes alongside a range of beers. Make use of the various sports and spa facilities on site, or explore the countless bars and discotheques in the surrounding Sachsenhausen area. Wireless internet access is available for an additional charge throughout the building. The air-conditioned Comfort room includes a balcony, a bedroom and a bathroom. It is equipped with a cable/satellite, 40" flatscreen TV, Sky, WiFi, safe and tea and coffee making facilities. The private bathroom includes a bathtub and a hairdryer. The Executive rooms are located from floor 15th of the skyscraper. The room includes a balcony with a beautiful view over the surroundings, a bedroom and a private bathroom. The room is equipped with a cable, satellite, 40" flatscreen TV, Sky, coffee and tea making facilities, minibar, WiFi (included in the price) and laptop size safe. The bathroom features a hairdryer, bathrobe, slippers, hamper and scales. The air-conditioned room includes a balcony and a bathroom. It is equipped with a 40-inch cable/satellite TV with Sky channels, free WiFi, a safe and tea and coffee making facilities. The private bathroom includes a bathtub and a hairdryer.